Name change • He took his case to the Utah Supreme Court. 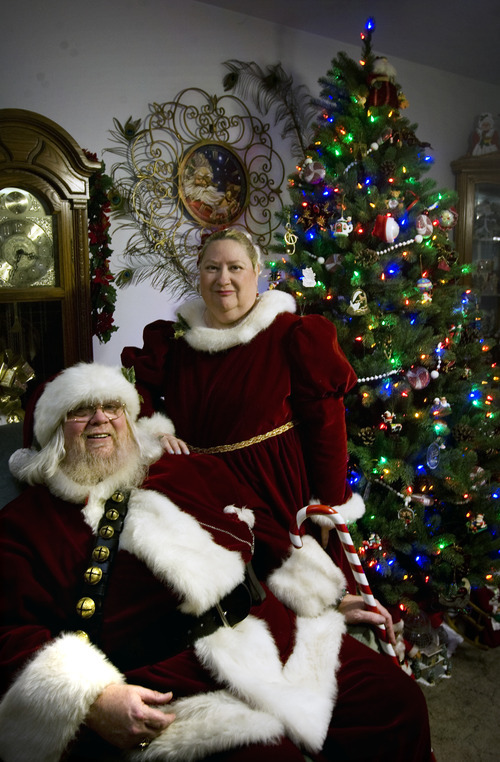 Kim Raff | The Salt Lake Tribune Santa Claus and his wife Alise Claus at their home in Murray on Dec. 23, 2012. Claus legally changed his name from David Lynn Porter after a lengthy court battle. 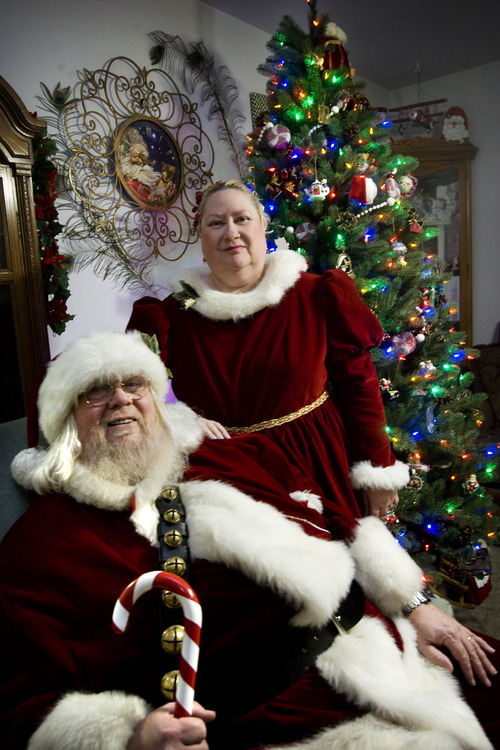 Kim Raff | The Salt Lake Tribune Santa Claus and his wife Alise Claus at their home in Murray on Dec. 23, 2012. Claus legally changed his name from David Lynn Porter after a lengthy court battle. Kim Raff | The Salt Lake Tribune Santa Claus, his wife Alise Claus, and their dogs (left) Crystal and Coal at their home in Murray on Dec. 23, 2012. Claus legally changed his name from David Lynn Porter after a lengthy court battle. Murray • Yes, Virginia, there is a Santa Claus, and he lives in Murray. State Street in Murray is already a festive place. Big red and green snowflake lights, that are also evocative of poinsettias, line the street, and a bright theater marquee reads "Have a Murray Christmas." But Friday night, a jolly presence arrived to make the holidays merrier. Claus stepped out of his red Ford Escape  the license plate reads SNTACLS  into the chilly air, ready to spread some Christmas cheer. Dressed in his classic suit with the addition of a heavy sash of bells, he jingled all the way to the Murray Arts Center. "Merry Christmas," he shouted over holiday music as he and his wife moved through the crowd who had come to dance. He shook their hands, took pictures with them and wished them well with a big smile. His wife, dressed like Mrs. Claus, followed him and passed out candy. Everyone returned their tidings and gifts with their own smiles and blessings. The 54-year-old Claus, born David Lynn Porter, had desired to be the jolly old elf since he was a child. He wanted to use the Christmas character&apos;s identity to bring joy and happiness to the lives of others. 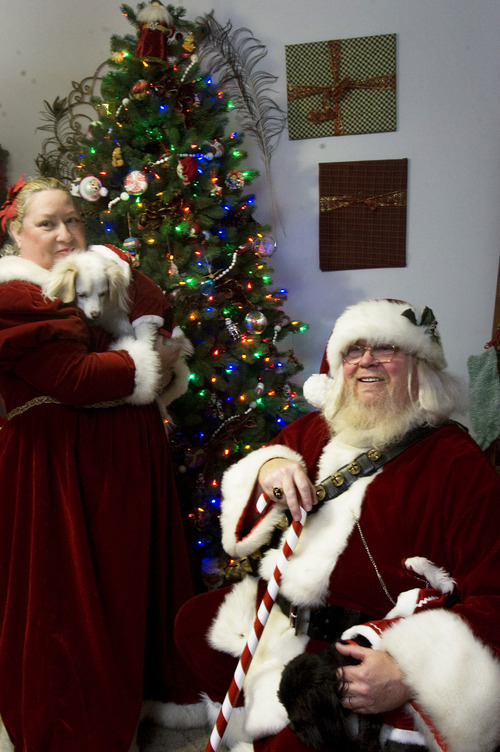 He started dressing like Santa more than 20 years ago after his wife, Alise Porter, needed one for her dance productions. After a while, he decided to become Saint Nick. He worked on his appearance by bleaching his red hair  including a big beard  every month. Instead of a sleigh, he used to drive a Utah Transit Authority bus while wearing his red and white suit. He took Santa jobs at receptions and parties at local churches and the Murray Ballet Centre. For years, he&apos;s appeared as Santa for holiday festivities and a food drive at The Peppermint Place, an Alpine ice cream and dessert store. "It&apos;s the spirit of giving and caring for kids... I&apos;ve always loved Christmas," he said. With his rosy cheeks and jolly laugh, children would always ask him if he really was Santa. He was determined to make it so legally, but he had to wage a legal battle to make his yuletide identity official, one that went all the way to the Utah Supreme Court. Legal name changes are a normal occurrence in Utah courts as people marry, divorce or decide to make a nickname their legal one, since they&apos;ve gone by it most of their lives. Courts rarely refuse the petitions. But in 2000, the 3rd District Court denied Porter&apos;s request to change his name to Santa Claus. "Honestly, I was shocked," recalled his attorney William Hadley. In most situations, courts grant a name change unless the new moniker is offensive, overly long or the petitioner plans to commit fraud. That was not the case for Porter, but unique to his request, Judge Timothy Hanson was concerned, among other reasons, that the change would have a chilling effect on people who wanted to sue him, since they would have to sue "Santa Claus.". "But my man, he was gung-ho about it," Hadley said of Porter. They appealed the decision. Porter submitted a list of men in Texas, Florida and Illinois who were in the phone book under the jolly old elf&apos;s name. His family supported him, and he had an e-mail from his credit union that the change would be fine with them, since "nobody would want to soil the name of Santa by not paying a legal obligation." He even offered "Kris Kringle" as an alternative. But again, the court turned them down. So Hadley and Porter took their case to the Utah Supreme Court. "Porter is the essence of Santa Claus," Hadley wrote in his statement to the high court. "He has the twinkling eyes, rosy checks, the full white beard and the jolly laugh that causes his belly to roll like a bowl of jelly. Children continually ask Porter if he is Santa Claus." Hadley also rebutted Hanson&apos;s "chilling effect" concern. The lawyer pointed out that there had been another Santa Claus who was sued in Utah courts, a California man who had his name legally changed and temporarily lived in Park City. "In this case, Porter should be allowed to change his name to reflect his desire to carry the spirit of love and joy, known as Christmas, with him all year long," he argued. In September 2001, the Supreme Court agreed and granted Porter his new name. Claus was at a store one day when a boy shouted "It&apos;s Santa! It&apos;s Santa!" The child&apos;s parents were quick to tell him otherwise, but Claus bet them otherwise. There it was on his driver&apos;s license: Santa Claus. Hadley has a picture in his office of Claus and his wife  Alise Porter kept her birth name  along with the check he wrote to the attorney for his service. The name on the check? Santa Claus. After the win, Hadley wrote a letter to Hanson noting that while he respects the judge&apos;s prior decision, he assured that his client will present and hold himself "as an appropriate embodiment of the thought of Santa Claus." Claus retired from UTA a few years ago and now lives on disability with a bad back. He gets around with a cane  of course, it looks like a giant candy cane. He used to make appearances two to three times a night during December as the character, though it&apos;s been a slower year. He&apos;s been ill, and the bad economy has people cutting back on holiday expenses. But he still makes a point all year of walking down the street with his wife, the two making a convincing Mr. and Mrs. Claus even outside of their red and white outfits, to keep the spirit of Christmas alive after December. Children who see him still shout with wonder and excitement that the man over there is Santa Claus. He responds with a jolly laugh, "Yes, I am." Every year, as certainly as love and generosity and devotion exist, Claus continues to gladden the hearts of children.